Prothane's bushing kits will improve those weak spots in your suspension by upgrading the original rubber with polyurethane. Prothane's Polyurethane Bushing Total Kits will replace soft or worn rubber suspension bushings with polyurethane, giving your vehicle tighter handling and secure alignment angles. Find the Total Kit for your vehicle below. Whether you want to update your vehicle's suspension to carve corners more securely, or you want a long-lasting durable option for your restoration project, Prothane's poly bushings will give you what you need. 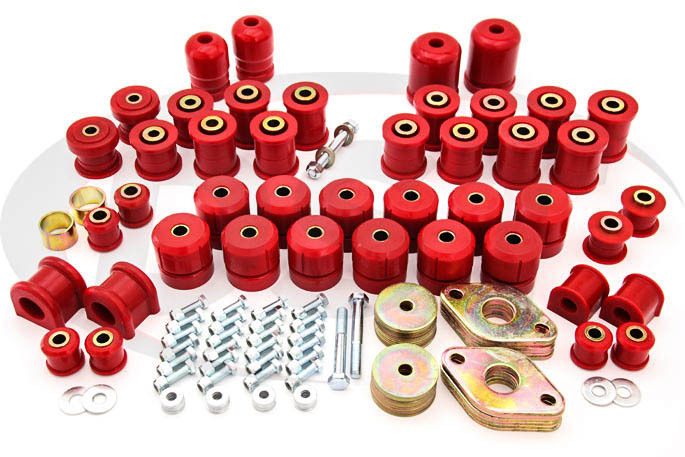 Total Kits include all the bushings required to improve the way your vehicle handles by providing a more stable option than rubber for the component-to-frame connection points in your suspension. The contents of a kit vary based on the make and model but most include stiffer control arm bushings for consistent tire alignment, rigid sway bar bushings that reduce body roll, and poly body mounts to keep the body and frame aligned for life. These kits have something to offer whether you're cruising in your classic around downtown Dallas, or tearing up your personal best at the local track. Prothane's bushing kits will improve those weak spots in your suspension by upgrading the original rubber with polyurethane. Rubber bushings change shape easily when your suspension travels and given enough time and use that shape change will become permanent. Polyurethane keeps it's shape much longer and the increased general longevity of polyurethane compared to the original rubber means you can enjoy the improvement for a long time. All of the poly bushings in these kits are Made in the USA and come backed with a lifetime warranty, so check out the kit for your vehicle!